Parents often ask me, “What age is old enough for their children to get glasses?” The answer is, “whenever your child needs them.” Typically one out of 20 preschool children has an eyesight issue. Is my child too young for glasses? While some children will require glasses before their first birthday, the majority of children begin needing them between six and 12 years of age. Correcting children’s eye problems at an early age is critical because they can inhibit normal brain and visual development if left untreated. When should my child get eye exams? The American Optometric Association states that babies need to have eye examinations by an optometrist or ophthalmologist between six and 12 months of age, again at age 3 and then every 1-2 years after that. A child does not need to be able to talk, identify letters or numbers, or be able to read in order to receive a complete eye exam. Typically, vision screenings begin at age three or four during annual checkups with pediatricians. It is recommended to have a thorough eye health and vision exam for your child before they enter school. 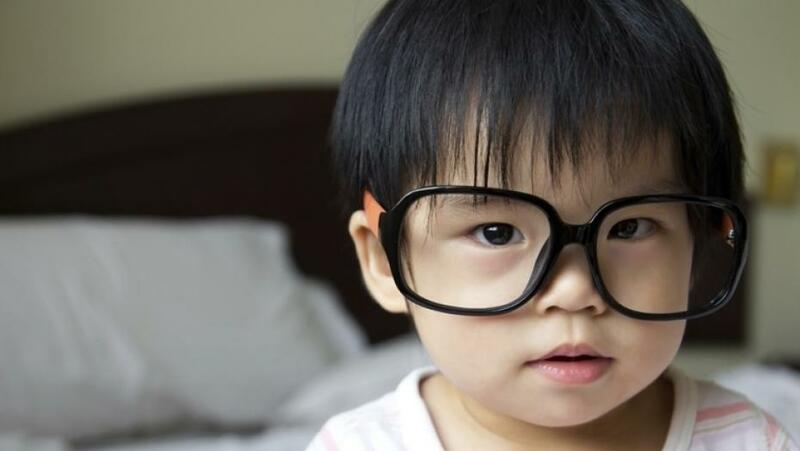 Are more children wearing glasses these days? The number of children needing glasses is rising due to the advancement of diagnostic tools, availability of treatment to slow down progression of near-sightedness, increased use of electronics, and heightened public awareness. What are the symptoms that my child may have an eye or vision problem? These symptoms are important signs to monitor in your children to ensure that there are no underlying eye conditions that need to be addressed. Some vision problems often associated with children are sometimes more complicated than just correcting farsightedness or nearsightedness with a simple pair of glasses. These eye problems in children are often corrected with glasses and/or an eye patch to strengthen the weaker eye. How can wearing glasses help my child? The benefit that a child receives from corrective eyewear far outweighs any negativity associated with it. Parents are relieved once their children can clearly see everything around them without struggle. The importance of maintaining children’s vision and eye health is imperative for their overall growth, development and academic success. If you have questions about your child’s vision, contact an optometrist or ophthalmologist to schedule a checkup.